The Lukens Band, founded in 1911, was originally intended as a “more attractive and wholesome” activity than baseball, for Coatesville youth on Sunday afternoons. With the belief that “music has charms to soothe a savage beast”, Mr. and Mrs. Charles Lukens Huston formed the Lukens Mission Band and then appointed the superintendent of the steel mill’s flanging department to teach the children to play music. At the start, the band played primarily for religious activities and church events. After several years and growing to 25 members, the band performed its first concert at Lenape Park, fostering greater exposure for public concerts and greater musical variety. 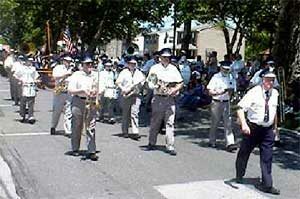 Through the years, the Lukens Band attracted more experienced musicians and became a regular part of area parades, including the Malvern Memorial Parade. Although the Hustons founded the band, its association with the Lukens Steel Company was not formalized until 1951 when the steel company took on the funding responsibility for the newly renamed Lukens Steel Band. That arrangement lasted forty-five years and included the 75th anniversary celebration in 1986 as the nation’s oldest surviving company sponsored band, whose members represented the nation’s oldest continuously operating steel company. Today, the band is incorporated as The Lukens Band, and enjoys the support of The Huston Foundation and The Stewart Huston Charitable Trust. The Lukens Band is really several groups, including the Marching Band that is performing for us today, the Concert Band and the German Band. The German Band, dressed in red vests, suspenders, lederhosen and green felt hats started in the 1950s and is a favorite throughout the county. Information for this article was provided by the Lukens Band website and reproduced with permission.